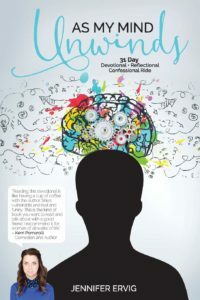 As My Mind Unwinds by Jennifer Ervig is a 31 day devotional that can help you on your journey with God. Each day has a new topic with introductory thoughts, scriptures, Jennifer Ervig’s take on the topic and questions designed for internal examination. Jennifer Ervig writes in a very personable way. This devotional is accessible for all. The reader can certainly identify with some of her thoughts. She is honest, open and down to earth. Various topics are covered from the Holy Spirit to spiritual battles “A Christian soldier must always be ready”, to Bin Laden, the Japanese quake of 2011 to Joshua, tithing and God desiring a relationship with us. “He sees me, hears me, and knows me. All He asks is the same in return.” The whole book speaks a great deal of sense. It will aid your Christian walk. “A poverty mentality says I can’t tithe. A rebellious mentality says I won’t tithe. A kingdom mentality says how can I not tithe? He’s been good to me. How can I give more?” – Dustin M Bates. I think this is a very powerful devotional and just perfect for connect groups to work through or for personal devotions. So what will I take away from this book? Love God and love people.